As the dark clouds of war gathered on the horizon the parish prepared itself for a new type of threat – `attack from the skies`. The photograph on the right features the local people who made up the team of Air Raid Wardens, First Aiders and Auxiliary Firemen. The young man sat on the right in the second row had the job of Messenger. Seated in the middle of the second row is the Rev Gower Jones, the W on his `tin-hat` denoting his role as an Air Raid Warden. The Vicarage became the centre for emergency communication with the installation of the first telephone to be fitted in Caverswall. A trailer mounted water pump for fire fighting duties was kept in a garage at Weston Coyney. The nation faced a bleak outlook in May 1940 following the defeat of the allied armies in France. An invasion by German forces seemed very likely and the government took action to strengthen home defences. A report to the Cabinet revealed that `the response was electrifying`. Within 6 days of the broadcast 250,000 had handed in their names. Ken Slinn of Weston Coyney was one of the first in the parish to volunteer for the force. The volunteers were invited to a meeting at the Weston Inn where they learnt that they were to become members of the Local Defence Volunteer Force, Stone Battalion, Sub Group E, A. Company. Platoons were also were set up at Meir and at Blythe Bridge. The area H.Q was located at the Windmill at Meir Heath. 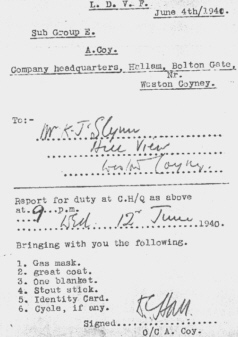 This is a copy of the orders requesting Ken to report for duty on the 12th of June 1940.The Company Headquarters were a large wooden shed located at the rear of Mr Hallams bungalow. In the beginning there were no uniforms or weapons hence the request to bring `a stout stick` amongst other items. Pedal cycles provided the only realistic alternative to walking, and in an emergency it would be the only method of getting a message to H.Q. The initial Commanding Officer was a Mr Hall, after a short period Mr L.A.V. Plumpton was appointed as the Captain. Mr Plumpton had seen action in the Great War and he was known to many as the manager of the Broadway Cinema at Meir. Winston Churchill thought that the title of Local Defense Volunteers was `uninspiring` and he arranged for the name to be changed to the Home Guard in July 1940. Churchill also took a prime role in ensuring that proper military training was provided and backed up by effective administration. The men were trained in field craft, making observations and in the use of weapons. Firing practice was arranged at Meir Aerodrome and at a training site at Burton on Trent. It was however to be some months before the men were issued with rifles of their own. The basic function of the platoon was to stand guard at two main locations and to raise the alarm should enemy parachutists be spotted. The H.Q. at Bolton Gate codenamed `Elsie` and a tent on Caverswall Common codenamed `Edward` were the two initial main posts. At a later stage a wooden observation platform was constructed on the roof of Weston Coyney Hall and this ended the damp and cold nights spent under canvas on the common. The men took it in turns to provide a guard through the evenings. Ken recalls that on one night each week he would get home from work just in time to have a meal and get changed before reporting for duty at around 8pm. The watch was shared with other men on a two hourly basis, thus it was usually possible to get a few broken hours sleep each night. The duty finished at 6am and he would then go back home for breakfast before setting off for work again. 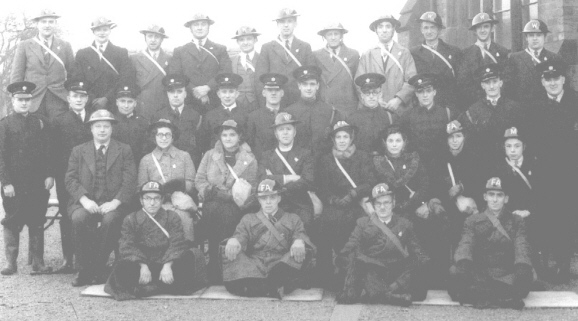 In addition to the weekly turn of duty the men were also required to attend the Company Parade which was held each Sunday and there were also occasional special exercises. 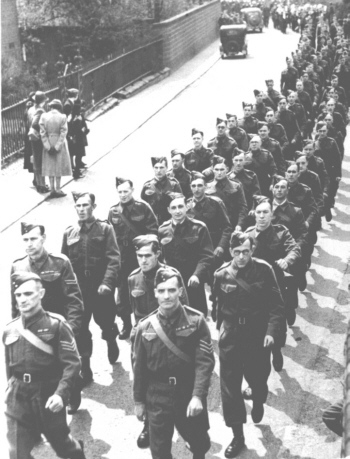 The photograph on the left shows the members of Weston Coyney Home Guard marching through the town of Stone. Fans of the T.V. 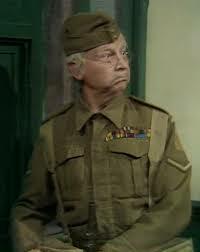 series `Dads Army` may be tempted to ask if the antics at Walmington on Sea came close to the realities of life in the Home Guard ? Ken Slinn recalls that everything was taken very seriously at the time. People were afraid that the Germans would mount an invasion, rumour and speculation about spies was rife. There was even a theory that people could have been sending secret signals by hanging out their washing to dry on certain days and by combining certain colours or garments, or was it simply a case of knickers to the enemy ! The Castle was occupied by an order of nuns – `The Servants of the Holy Ghost`. The Mother Superior was a German national, clearly someone who needed to be watched! Nearby was the R.A.F. aerodrome at Meir and there were several vital factories and installations in the local area. Diligent as they were, the members of the Home Guard could not have known that a key element of Britains greatest secret of the wartime secret was located just a few miles away at Cheadle. Woodhead Hall was the hub for a network of secret monitoring stations. The members of the platoon were very concerned about their ability to deal effectively with an enemy incursion. When rifles were finally supplied they were issued without any ammunition. Despite these concerns life had to go on and a sense of humour was never far from the surface. In the early days a humorous version of the letters L.D.V. were taken throughout the country to signify – Look, Duck and Vanish. The A.R.Ps did not escape the attention of the wags, their nightly patrols earning the label – Arseing Round Pubs. An air raid siren was installed on the roof of the electricity sub-station in Weston Coyney Road. On a typical night the siren would first sound at about 11pm to be followed by the all clear signal as the enemy flew past on their route to Crewe, Liverpool or another of the many northern targets. A few hours later the sirens would wake everyone again as the bombers followed their homeward course. The Home Guard learned to recognise the sound of the enemy bombers as they flew overhead. Ken pointed out that the passage of these aircraft would sometimes last for several hours and of course, nobody knew if they were just passing over, or if the local area was the intended target for that night. In the event the parish escaped lightly, a stick of bombs were dropped near to Dilhorne another near to Hulme and incendiary devices were dropped at Mossfield Colliery. On one occasion the platoon were asked to take part in a mock invasion of the Potteries with regular soldiers taking the role of the enemy. Bren Carriers and troops swept through the crossroads at Weston Coyney at high speed. One of the platoon members had been planning to use his own lorry as a road block but when he saw the speed of the column along the road he changed his mind. His pride and joy would have been simply brushed aside and reduced to a smoking wreck by the advancing armour. The passing troops took any pedal cycles that they found and shouted to the onlookers `tell the owner to pick it up later at Stoke railway station`. Ken Slinn was standing at his post near to the crossroads, one of the military umpires stopped and pinned a label on to Kens tunic. The label stated `Small penetrating wound to the chest, patient coughing blood`. Ken was told to lie down on the pavement and to wait for an ambulance. It had been raining and Ken did not fancy the prospect of a lengthy and damp wait. He wrote on the reverse of the label `Patient died from loss of blood` and made his way back to Weston Coyney Hall for a cup of tea ! On another occasion the alarm was raised because it was thought that part of a parachute harnesses had been found in Creswells Piece wood. The Home Guard were called out and Ken was given the task of stopping and searching vehicles at a road junction. A lorry was stopped and another member of the platoon climbed on to the back of the lorry and under the tarpaulin to conduct a search. Ken gave the signal for the driver to continue before the search was completed and despite knocking on the wall of the lorry cab the platoon member was not able to persuade the driver to stop until he had reached the next village at Cellarhead. Perhaps the driver thought that he had got an armed German pilot or paratrooper on board ? This is a page from a Home Guard Training Manual that was published in 1941. In this case there was an emphasis on teaching shooting skills and field-craft. 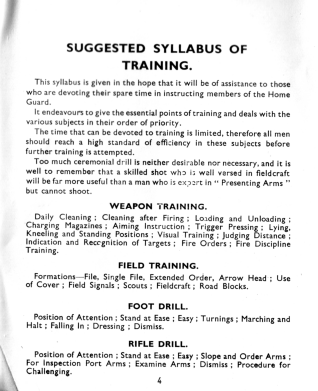 The members of the Home Guard following this manual would have to pass a test to show that they could put the training into practice. The test included a General Knowledge Section with ‘questions framed to bring ‘:- Location of Battalion, Company and Platoon Headquarters. Position of vital points such as Post Office, Police Station, Electricity Works etc near to a mans post. Nearest route from the post to various Headquarters. Alternative routes to various points if main routes become impassible. Procedure for challenging, searching and detaining persons acting suspiciously. What kit to bring and place of assembly in case of an alarm. Who can forget the catch phrase used by the much missed Corporal Jones ? Typically with rifle in hand shouting “They don`t like it up em, cold steel you see Sir, they don`t like it up em”. Bayonet Training Instruction – ‘The objective is to develop the offensive spirit, and teach the best methods of offence and defence. Useful for close quarter fighting, night fighting, clearing villages and woods and when it is necessary to kill without noise’. In the end those skills were never put to the ultimate test on our soil but we can be grateful that the members of the Home Guard were ready and willing to do their bit for the defence of the realm. Rob Wilton was a popular comedian in the 1930s and 40s. He was famous for his monologues. 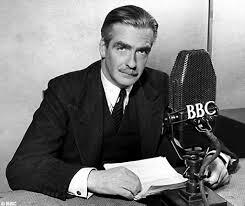 The subject of one of these was the Home Guard, you can listen to Rob performing his monologue by clicking here.